Jaipur, February 2: In a tragic incident, a 40-year-old woman was mauled to death by a tiger in Sawai Madhopur district of Rajasthan on Saturday. According to reports, the incident occurred in the fields of Padli region under Ranthambore National Park at around 6 am. 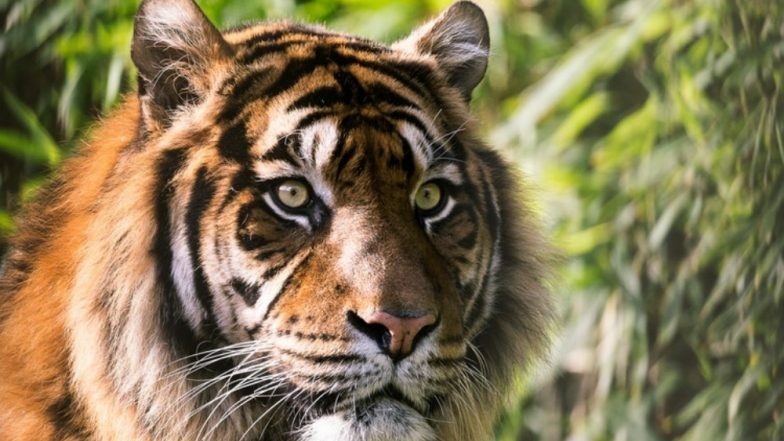 An official of the forest department informed that the tiger population in the reserve has increased to 70, the highest in the reserve's history. SDM Laxmikanth Katara was quoted by ANI saying that the rescue team and police were rushed to the spot as soon as the incident was reported. The body has now been sent for postmortem. The deceased has been identified as Munni Devi. According to reports, the incident took place while the victim was returning home from her farms. Man Mauled to Death by Lions in Punjab Zoo, Probe Ordered to Know How He Entered Enclosure. In the last month, a man was mauled to death by lions at Chhatbir Zoo in Zirakpur in Chandigarh. According to details by officials in the zoo, the man entered the enclosure by scaling an over-25-feet wall and as soon as he crossed over, he was attacked by two lions. Man-Animal Conflict: Leopard Who Mauled Over 20 People, Killed by Rajaji Tiger Reserve Officials in Motichur Range. In a similar incident during December last year, a 65-year-old woman in Sawai Madhopur was mauled to death by a tiger. According to a report by TOI, Kotwali police station informed that the victim, identified as Naroti Devi Koli was a resident of Koli Mohalla and used to regularly visit a small lake located alongside the jungle for washing clothes.